In interview in Spanish, Rubio says Obama's DACA program "important"
Republican presidential candidate Marco Rubio is toeing a careful line when discussing Obama's key immigration deferral program to Spanish-language news media. "I believe DACA is important," Rubio said in an interview, conducted in Spanish, with Univision host Jorge Ramos. "It can't be terminated from one moment to the next, because there are already people benefiting from it." 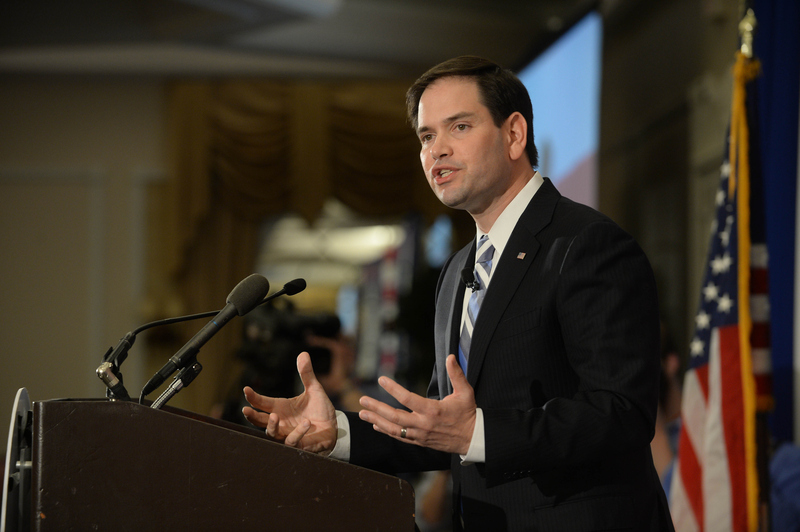 Would Marco Rubio attend a gay wedding? The English translation of Rubio's remarks, published by Grabien, shows the Florida senator taking a softer tone when addressing his Spanish-speaking audience about the Deferred Action for Childhood Arrivals (DACA) policy. "I'm still saying it's important to modernize our system and that means improving the way we enforce in the future, modernizing the immigration system so that it isn't as costly and bureaucratic," said Rubio, who announced his White House bid in Miami on Monday. "We have to deal with the 12 million human beings who are here and no one -- no one -- is advocating a plan to deport 12 million people, so that topic has to be dealt with as well." Those who qualify for DACA -- undocumented youths, sometimes called DREAMers, who arrived in the U.S. before the age of 16 -- are allowed a two-year reprieve from deportation and can be given work permits. Mr. Obama's latest executive action includes an expansion of DACA, but a federal district court in Texas put a temporary hold on the process this February. Rubio seemed to suggest that the United States would have to phase out the deferred action policy eventually. "At some point it is going to have to end," the senator said. "That is to say, it can't continue being the permanent policy of the United States." But, he continued, "I believe, if I become President, it is going to be possible to achieve immigration reform." In 2014, Rubio said he wanted to "wind down" the DACA policy, believing it played a large role in drawing unaccompanied minors from Latin America to cross illegally into the United States. The Republican senator asserted that Obama's 2012 institution of the DACA policy was a major cause of last summer's border crisis. "Because the recent wave from Central America spiked after DACA was announced, it is in our interest to wind down this program," the Florida senator said in a statement last July. "If you are not currently in it, you should not be eligible for it." "For President Obama to raise hopes it may actually be unilaterally expanded is irresponsible and threatens to make this problem even worse," Rubio had said.